This is a unique SMS mod. 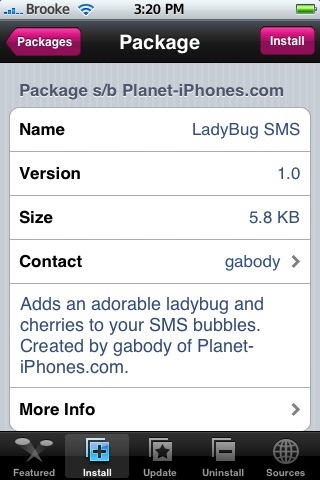 When installed, it will add ladybugs, leaves and cherries to you SMS bubbles. 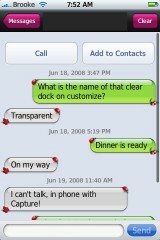 Your SMS messages will have a ladybug and cherries…the reply SMS messages will have a ladybug and a leaf. I know, it is girly but…girls do own iPhones!! :) Also, I had no issue installing or uninstalling this application. When I install it, the mod showed-up…when I uninstalled it, it went back to stock. Simple and easy. 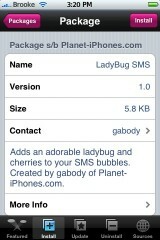 The LadyBug SMS mod is avilable through the Planet-iPhones source. Note: when you install this mod, it will remove you custom chat bubbles…at least it did for me, mine where added via Customize. Where are the lady bug screen shots? It was taken off because apparently someone (that would be me!) forgot to take Doug’s number off the screenshot before I posted it. But, I fixed it and reposted it! hey just wondering if there are any other mods like this one? and what sources they are from?